Full sun in spring, partial shade in summer. Good. 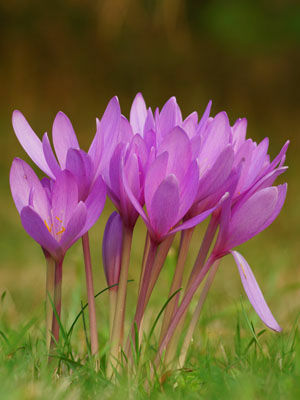 Fall-blooming colchicums (C. autumnale) are hardy to -25F (-32C). Fertilize with a balanced organic fertilizer in spring, when new growth appears. Colchicums make their green growth in spring, so they work well when grown with daffodils and other spring-flowering bulbs. Flowers emerge in fall on bare stems. Set out bulbs from mid to late summer, while they are dormant. Cover the bulbs with 3in inches (8 cm) of soil. Colchicum bulbs are expensive, but will persist for years in good locations. Colors include pink, white and lavender. Despite their short stems, colchicums make good cut flowers. Harvest when the buds are just beginning to open. Allow unharvested flowers to remain in the garden until they set seed, if possible. Mark the location of your colchicums with stones or a garden ornament so you don’t accidentally dig them up. In late spring, allow the foliage to die back naturally.